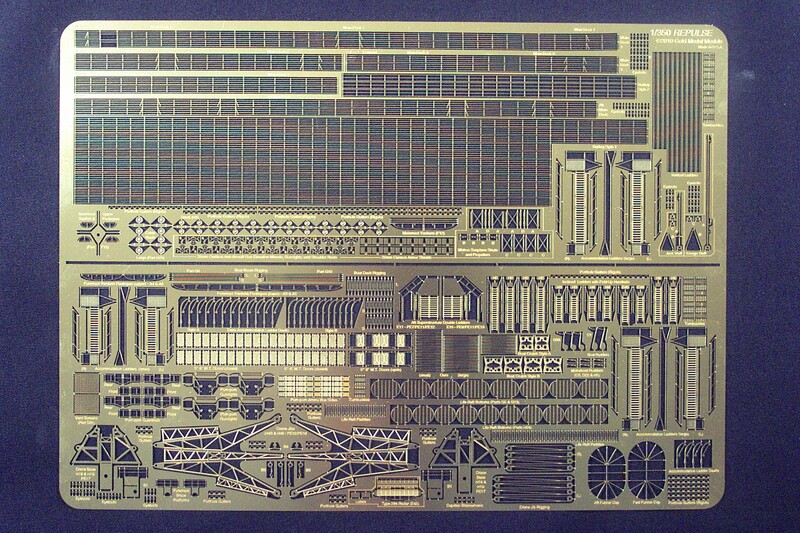 This set is custom designed for the Trumpeter HMS Repulse kit and contains the following items: custom fitted and pre-shaped main deck railing with pre-positioned locations for chocks & diagonal braces; vertical ladders; watertight doors in open and closed versions; inclined ladders in all required sizes; Type 284 radar antenna; two complete boat cranes with rigging and hooks; details for 2 pdr Pom-Pom guns including elevation rings, gunsights, ammo box covers, & pre-shaped guardrails; gunsights, armor shields, handwheels, and shoulder rests for 20mm Oerlikon cannons; see-through screens for intake uptakes; paddles plus see-through bottoms for life rafts; highly detailed replacement yardarms in the correct shapes for both masts; funnel cap grilles for both funnels; rudders, oars, & 3-D relief-etched fold-to-shape crutches (chocks) for ship's boats; cable reels in two sizes; anchor chain capstan brakewheels; six accommodation ladders with detailed davits & rigging; jackstaff & flagstaff; struts & propellers for Walrus seaplane. Extra turnbuckles, eyebolts, and porthole rigols (gutters) are provided for custom work. Numerous spare parts are furnished in the event of loss or damage.